The database RegData quantifies the regulatory restrictions produced by each federal regulatory agency each year. We used RegData to merge its agency-specific restrictions data series with data on agency budgets from the Regulators’ Budget, produced by the Regulatory Studies Center at George Washington University. This combined dataset allowed us to examine the simple correlation over time between the number of regulations an agency had published and the agency’s budget. 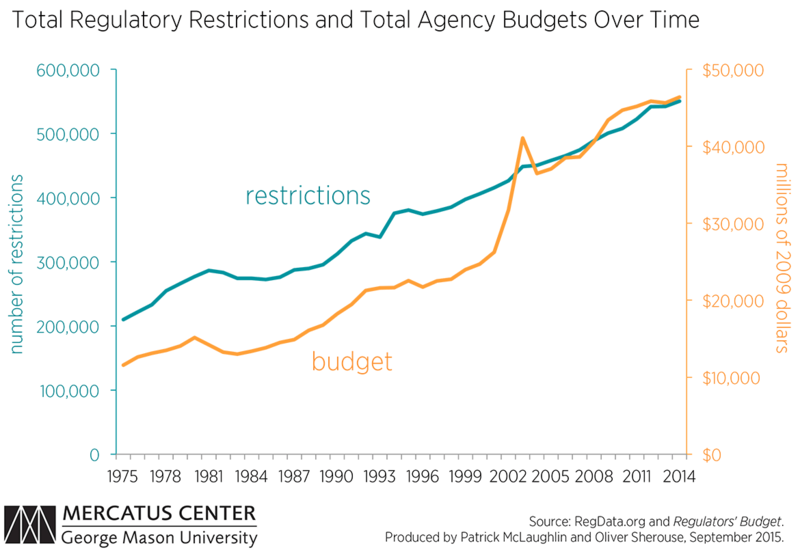 Figure 1, below, shows these two series in the aggregate: the total of regulatory restrictions published by all agencies each year and the total of all agencies’ budgets in each year. Restrictions are defined as words used in legal language to either obligate or prohibit an action. RegData specifically searches for a subset of all restrictions, consisting of the strings, “shall,” “must,” “may not,” “prohibited,” and “required,” and tallies them for each agency in each year. Agency budget data is given in millions of constant 2009 dollars. These two lines—total agency restrictions and total agency budgets—move in the same direction. In fact, over the period for which we have data (from 1975 to 2014), the simple correlation between total of all regulatory restrictions and total of all agency budgets equals 0.91. (A correlation of 1 would indicate a perfect match.) Note that this figure only includes restrictions for the agencies included in the Regulators’ Budget. RegData covers all government offices that publish in the Code of Federal Regulations, while the Regulators’ Budget is less comprehensive. Two aspects of figure 1 stand out. First, the common direction they share is upward. Regulatory restrictions and regulatory budgets have grown more or less continuously since at least 1975. Second, there is a large spike in total agency budgets from 2002 to 2003, caused by the surge in employment at the Transportation Security Administration in response to the September 11 terrorist attacks. TSA was formed in 2001 and quickly became one of the largest federal agencies in terms of budgets. However, most TSA employees are engaged in aviation security operations, not in writing regulations. 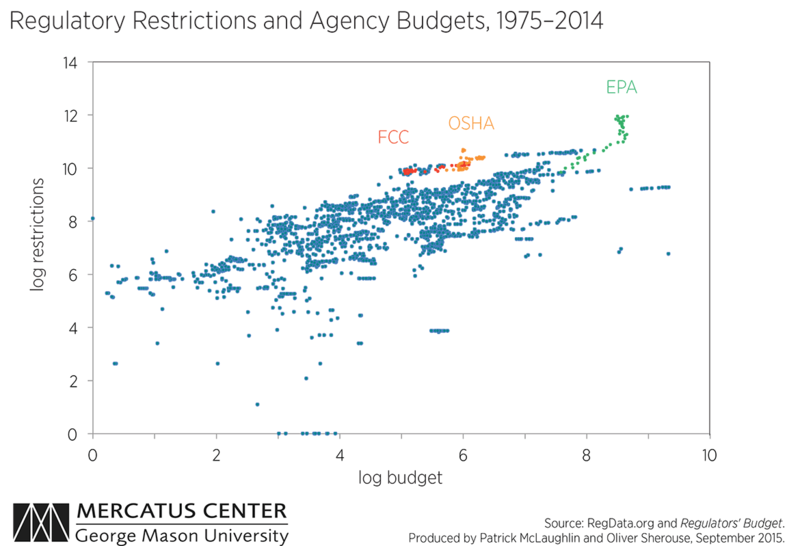 Figure 2, below, is a scatterplot of restrictions and budgets for all agencies between 1975 and 2014. As one would expect with such a highly correlated series, we observe most points along the 45-degree line. However, at this more granular level, while the correlation between budgets and restrictions remains clear, there is more variance from year to year and agency to agency. We have highlighted a sample of three large regulatory agencies: the Environmental Protection Agency (EPA), Occupational Safety and Hazard Administration (OSHA), and the Federal Communications Commission (FCC). Within these three agencies, we note one interesting trend: even though the EPA’s budget has remained nearly flat since year 2000, the number of its restrictions has continued to grow. While the correlation between agency budgets and the levels of agency restrictions is clearly high, the question of whether one causes the other remains unanswered. If budgets are increased, does regulatory output correspondingly increase? Do budgets change in response to changes in regulatory output? Or is a third factor—such as new legislation directing agencies to regulate or deregulate—the driving force? This analysis does not answer those questions. Instead, we hope that by highlighting the correlation between these two unique datasets, others will be able to explore the possible relationships between the legislative, budgeting, and regulatory processes.